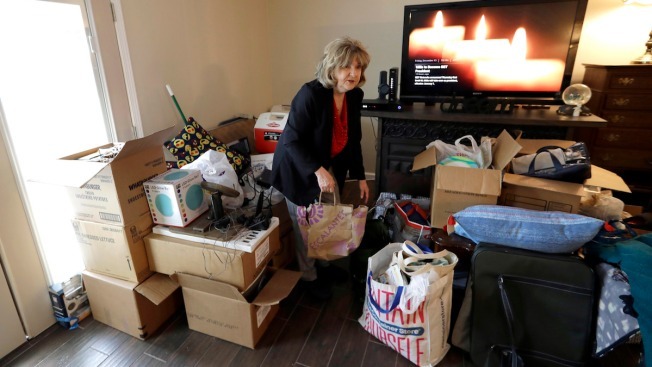 Deb Eberhart sorts through her belongings Friday, Dec. 15, 2017, in Houston. Eberhart, who recently returned to her remodeled home, had to evacuate during Hurricane Harvey as floodwaters filled her neighborhood. A group of psychologists has offered free counseling sessions to people working to recover from Harvey. Eberhart sought out the counseling sessions after realizing that the stress from the whole situation had left her frequently in tears and grinding her jaw. Deb Eberhart couldn't sleep and was easily moved to tears as she worked to coordinate repairs to her Houston home in the months after flooding from Hurricane Harvey besieged it with 3 feet (0.91 meters) of water. But anger, resentment and feelings of isolation and abandonment can creep in during the "disillusionment" phase, when survivors struggle to rebuild. The "reconstruction" phase follows — and can last for years — as victims learn to accept that everything won't be the same.